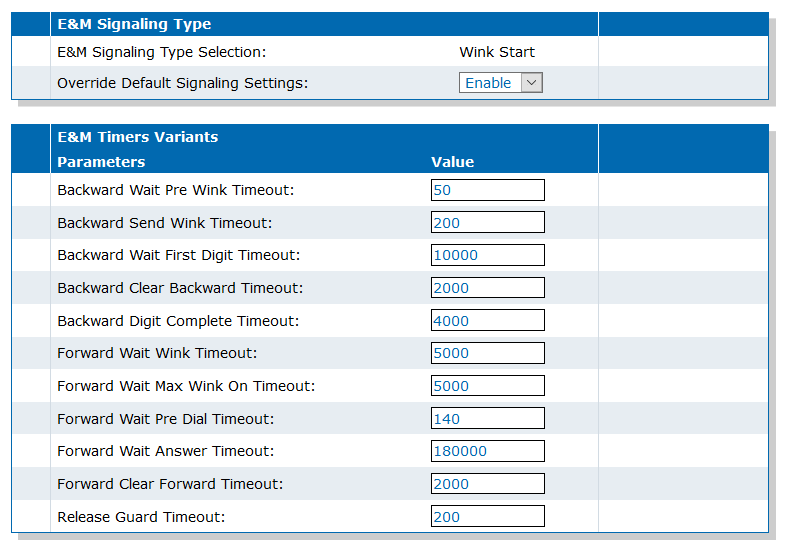 When using CAS signaling, each traffic channel has a dedicated signaling channel. In other words, the signaling for a particular traffic circuit is permanently associated with that circuit. E&M (earth & magneto, or ear & mouth) is a type of CAS signalling that defines line signaling and register signaling. It is also called Signalling System R1 and is mainly used in North America. E&M was originally developed to allow PABXs in different geographic locations to communicate over an analog private circuit. Some digital interfaces such as CAS also use versions of E&M signaling. The terms forwards and backwards are heavily used in descriptions of E&M. Forwards is the direction from the calling party to the called party. Backwards is the direction from the called party to the calling party. Go to System /Hardware . In the PRI Ports Configuration table, located on the same line as the port you wish to dedicate to E&M signaling, from the Signaling selection list, choose E&M . When changing from E&M to ISDN/R2 or ISDN/R2 to E&M, you must change your routes accordingly. For instance, if you are in ISDN with a route isdn-Slot2/E1T1, then change to E&M, you must change the route to e&m-Slot2/E1T1. From the Line Type selection list, choose T1 . Go to E&M /E&M Configuration . From the Select Interface selection list, choose an E&M interface. The number of available interfaces depends on the Mediatrix unit model. In the Interface Configuration table, configure the fields as required. The E&M Auto-configuration feature allows the detection and the configuration of all, or a specific, E&M interfaces so that the E&M link goes up and becomes usable with a minimal user interaction. When launching an auto-configuration process, it stops automatically when all selected interfaces have been tested. For each interface, the auto-configuration process is considered a success when the link becomes up or a failure when all combinations have been tried without having a link up. Launching auto-configuration may terminate abruptly all ongoing E&M calls. Go to E&M /Status . 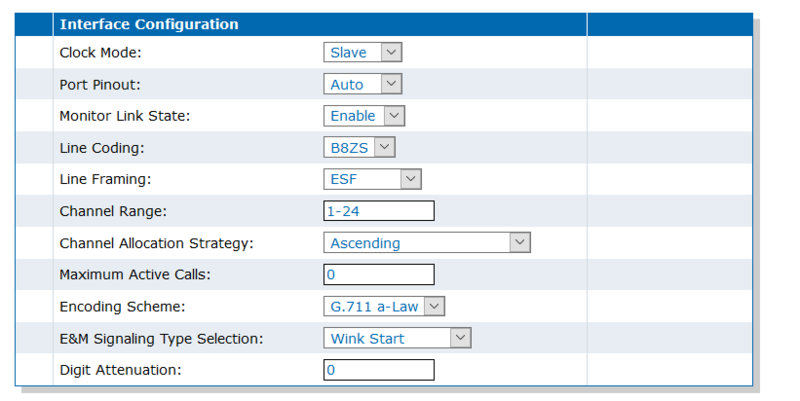 In the Automatic Configuration table, from the selection list, choose the interface to auto-configure. Please note that some parameters cannot be auto-configured. For instance, the clock mode is configured according to the endpoint type, master for NT and slave for TE. Auto-configuration on all E&M interfaces may take some time to complete. Some of the current E&M settings might be replaced by new values. It is possible to save a set of configuration as presets for future E&M connections. Using preset files is especially useful for units that do not use the default values provided by Media5. These preset configuration files are located in the file system's persistent memory listed in the DGW Web interface, under Management /File and they differ depending on the Mediatrix unit you are using. Only script files can be used as R2 Preset configuration. It is also possible to export the current E&M configuration in a Preset Configuration file. User-defined presets are not kept in the event of a factory reset. In the E&M Preset Configuration table, in the Preset Name field, indicate the name of the Preset. The current E&M configuration is exported. to the File management system. The preset configuration will be available in the Suggestion selection list. In the E&M Preset Configuration table, from the Local Preset selection list, choose the configuration file to apply. Overriding the default settings is considered an advanced configuration. Media5 recommends not to modify the signalling variants unless you know exactly what you are doing. Go to E&M /Signaling . From the Select Interface selection list, choose an E & M interface. 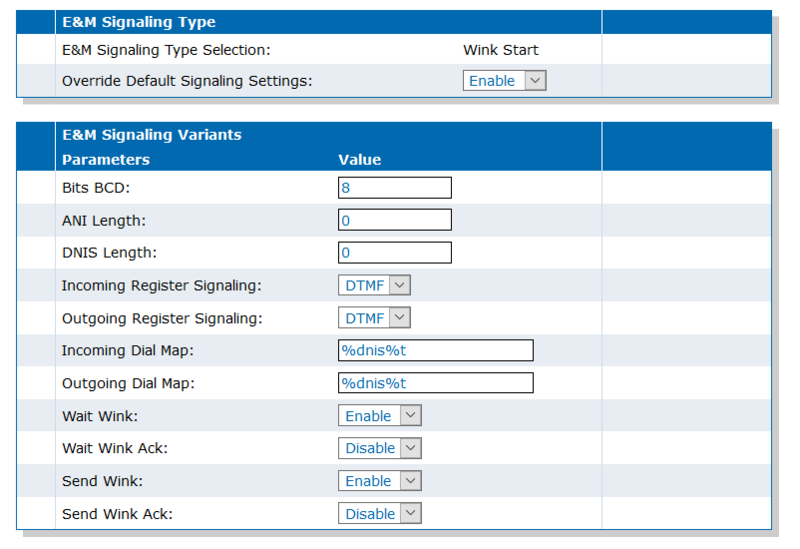 In the E&M Signaling Type table, from the Override Default Signaling Settings selection list, choose Enable . Click Reset to Default to update the values with the selected country. Once the Override Default Country Settings is enabled, the indicated values in the table are not from the specified country in the Country Selection . To get the appropriate values of the selected country, you must reset the table values first. In the E&M Signaling Variants table, complete the fields as required. This is an example of configuration. Go to E&M /Timers . In the E&M Timers Variants , complete the fields as required. Go to E&M /Digit Timers . In the E&M Digit Timers Variants , complete the fields as required. Go to E&M /Link Timers . In the E&M Link Timers Variants , complete the fields as required. The PRI statistics are available in the Hardware.StatsInfo table. To reset the statistics, you must set "ResetStats" in the Hardware.StatsInfo.ResetStats parameter.